It’s one of the most incredible displays of raw aggression, relentless pursuit and unbridled ferocity you’ll ever see in the ocean. Sharks? Nope. Orcas? Uh-uh. No, we’re talking about the flood of king and Spanish mackerel that move down the Gulf Coast each fall. After spending the warmer months in the northern Gulf, the fish follow migrating bait schools down toward their wintering grounds in the Florida Keys. Along the way, this toothy parade offers the potential for absolutely unchained action. Generally, tournament-winning kingfish in that 40-plus-pound range tend to remain offshore where they can avoid the clutter and hunt bigger meals in solitude. 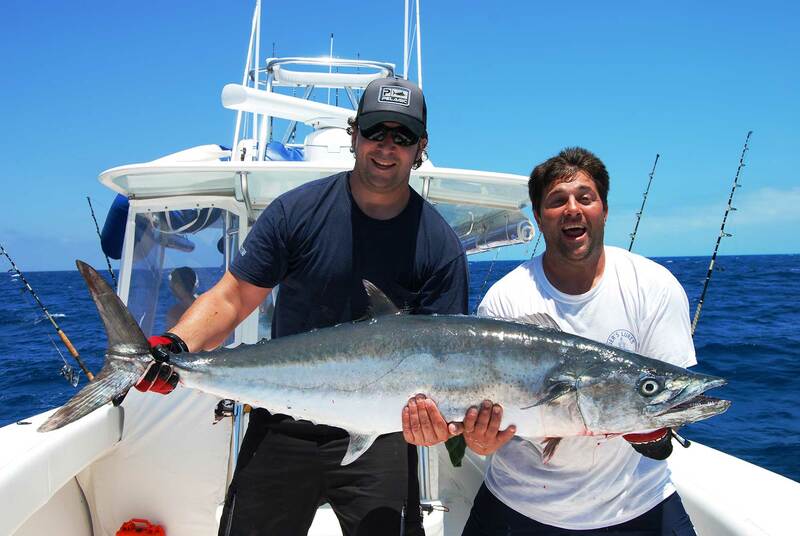 However, you’ll find plenty of quality kings in the 20- to 30-pound class, along with thousands of juvenile schoolies and whopper Spanish mackerel. 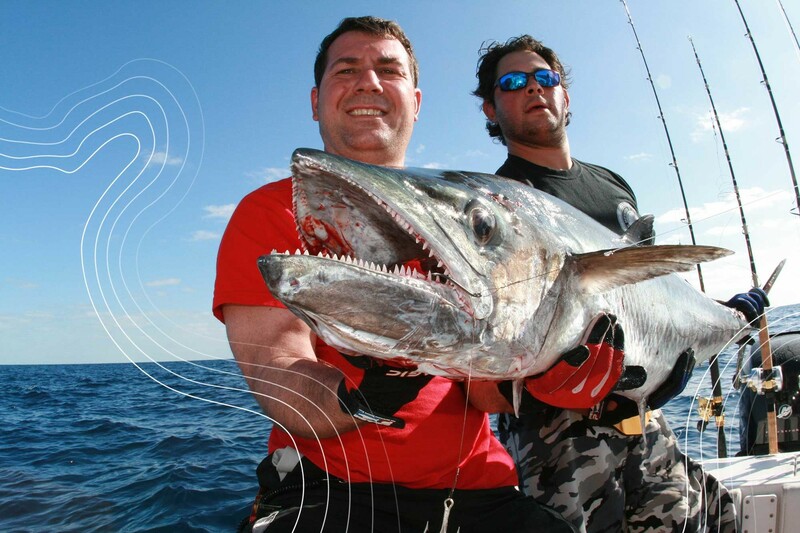 Along the way, you’ll also find pods of bonito and aggressive bluefish joining the party. Find ‘Em: Nearshore reefs, rock piles and ledges are your main targets; but you might also find the action starting less than a mile from coastal passes. Watch for signs of feeding frenzies — white water explosions, raining bait schools, screeching birds — and then concentrate on these hot spots. If you’re starting from scratch and the morning offers no visual clues, just slow troll a couple of live baits or drag spoons and plugs at a brisk pace. A handful of strikes in a tight area merits a focused effort. These smaller baits are also advantageous for chumming; first, to attract the fish and second, to hold them behind your boat. Positioning is critical here, so establish an anchor heading that keeps your chum right over the spot you’re fishing. Otherwise, you might actually chum the fish away from the concentrated area and that dilutes the effort. Tip: Once you get the fish fired up, they’ll crush every hooked bait you deploy. But don’t slack off with the chumming. A handful of baits every 5 minutes or so will help maintain the fish’s interest. If the bite slows, hit them with more freebies or you’ll risk losing the school. Sting ‘Em: For optimal fun with this incredible beach action, you’ll find that medium-heavy spinning gear loaded with 20-pound monofilament will handle most anything you encounter. Any giant kings that wander into the shallows will bully the others out of the area, so as long as you’re seeing lots of the smaller fish, you’re in business. A stinger rig made of a 1/0 Mustad Hoodlum lead hook, No. 4 wire and a No. 4 or 6 Mustad 4X Strong Kingfish Treble Hook works well for slow trolling. For anchor fishing, single hooks with wire leaders are more efficient and facilitate release.